“Oh! That’s funny, Chick!” replies Chickee before returning the favor with a BOO! of her own. Author Claude Ponti’s ending - “Well, tomorrow we can play with B!” - leaves readers wondering what might happen next and gives grown-ups a great opportunity to discuss exactly that with their young readers. 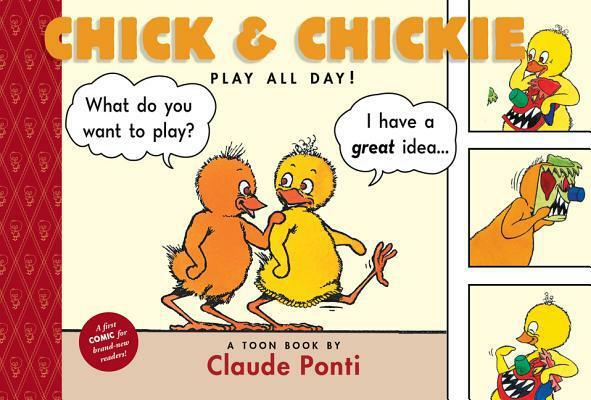 With Chick and Chickee Play All Day!, Toon Books has added to their small but steadily growing library of graphic novels for younger readers. Toon Books are grouped into Levels 1, 2, and 3, and each book contains easy to understand descriptions of each level inside the back cover including recommended grade levels, lexile, guided reading and reading recovery levels. But don’t let the educational jargon fool you. These books are not contrived just to fit a category. Toon Books are genuinely fun, kid friendly, and re-re-re-re-readable. There’s something new to discover with every bed time, story time, and reading time, perfect for showing your newest readers the joy books hold.